Just a few days ago, me and my girl friends went to Let's Face It Timog branch and got our eyelashes permed. We've been planning on having one in the past years and obviously been postponing until now. What got us to finally do it was when I saw how good it looked on two of my other friends who had eye lash perming a week ahead. I immediately got in touch with my other friends to try it for ourselves. The finished product is truly satisfying! Before the procedure, we were asked to sign a waiver and an information sheet. In the clinic, they instructed us to lie down and close our eyes the entire time. I sort of felt a little awkward not seeing my surroundings but I eventually got the hang of it. They cleaned the area around my eyes with a damp cotton and placed an adhesive strip on the edge of my eyelids near the roots of my lashes. Strands of my upper lashes were attached one by one to the adhesive strip and once in place, my lashes were coated with a mildly scented perming solution which reminded me so much of the classic solution used in the 80's (Pagoda). A thin plastic strip was used to cover my eyes for 20-30 minutes. A second coating of the same solution was applied and left to stand for another 20-30 minutes. The adhesive strips were peeled off and the lashes were gently combed in place and coated with a waterproof mascara. Honestly, it didn't sting, hurt or cause eye irritation. The result was more satisfying than I imagined. 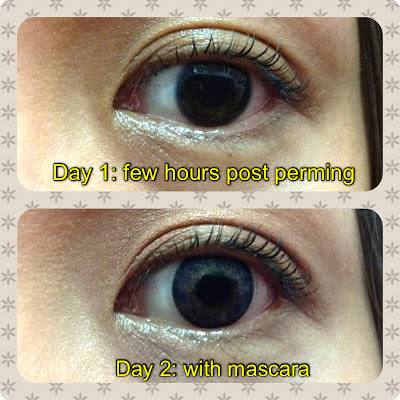 Compared to my short and thin natural lashes, my newly permed lashes were perfectly curled. It even looked better than when I used a lash curler paired with mascara. The beauty consultant said the curl will last for a month and that you can only do it again after 3 months. 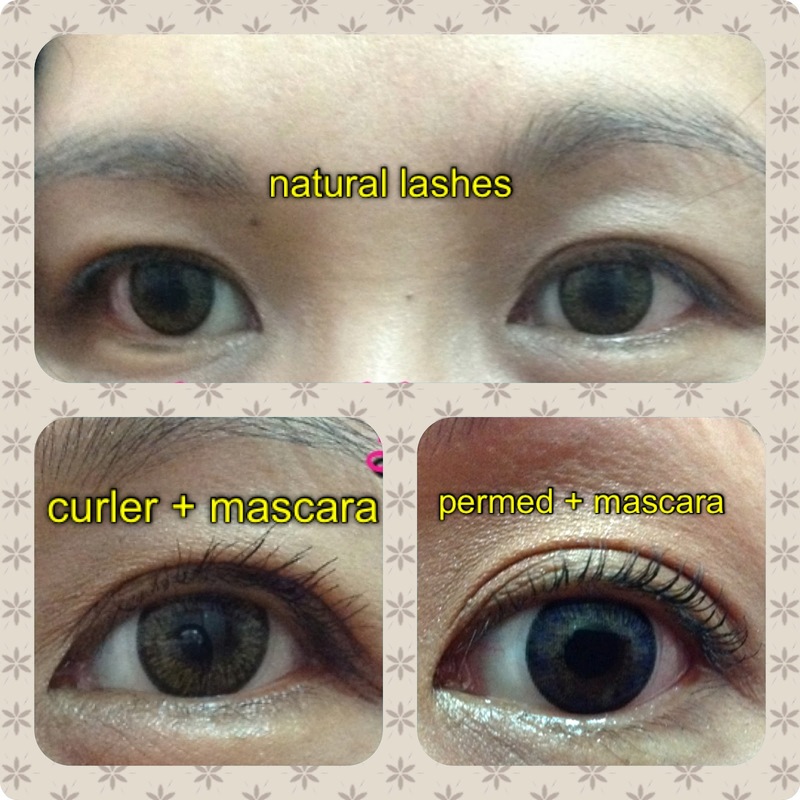 I'm loving my permed lashes so much that I intend to have it done on a regular basis. I also recommend this to those who have medium length and long lashes. Very short lashes may not be advisable for perming.